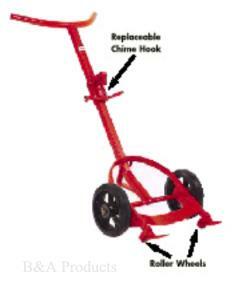 Versatile drum truck has replaceable chime hook that handles drums 25" - 48" high. 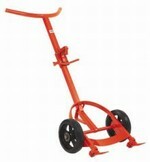 Large wheels carry the load easily and smoothly. 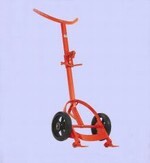 Small steel roller wheels behind the toes facilitate pallet loading/unloading. Heavy duty all-steel frame, with 1-1/4" curved pipe handlebar and 12 gauge 1-1/2" square tube upright. 24-1/2" wide x 59" tall.